Autoresponders allow you to send an email to users after they start a new issue (either via the web interface or through email). To set up autoresponders, go to Admin > Site Settings > Email Setup > Autoresponders. From there you can create any number of autoresponders and attach them to a category. Each category can only have one autoresponder attached. After you attach this autoresponder, when users start a new discussion in a given category, they will receive the autoresponse via email. Autoresponders are parsed with Liquid, and follow the syntax described in the liquid wiki. 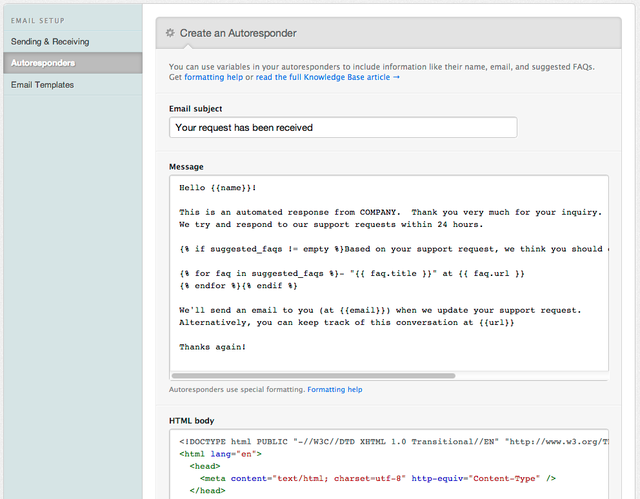 You need custom branding to use the HTML version of the autoresponder. If you use the HTML version and modify it, be sure to keep the plain text version in sync. Most users will only see the HTML version, but some client will use the plain text version, so for best compatibility, it's best to have both look good and be accurate.